When mentioning Dublin you usually think of Ireland, but there is another Dublin, which is a historical, friendly and welcoming suburb of Columbus, Ohio. Dublin features both centuries-old buildings and new urban buildings, including chic restaurants, professional businesses, shopping areas, unique bars and night life that’s nestled within a beautiful landscape within walking distance from the Scioto River. Exploring this city won’t be complete without a stay at the sophisticated and brand new AC Hotel Columbus Dublin, located only 20 minutes away from downtown Columbus, Ohio. The hotel’s history is also iconic. The General Manager Orcun is an incredible and hardworking person that made everything possible to bring this beautiful hotel to life. A native of Turkey, he eventually moved to Ohio and brought along an incredible team including a talented and lovely bartender from Istanbul. The AC Hotel Columbus Dublin is the only hotel located in the new, urban Bridge Park development that offers a large selection of hot spots and entertainment. The hotel has been thoughtfully designed and inspired by European style and culture and offers 150 spacious guest rooms, including six corner king rooms and five meeting rooms, totaling 1,570 square feet. The meeting rooms are equipped with state of the art technology and perfect for training sessions, presentations, interviews, and corporate events. After a restful and comfortable night, guests can wake up and indulge in the European-influenced breakfast, including a variety of cheeses and meats, along with other special treats served at the AC Kitchen. While enjoying your stay at the AC Hotel Columbus Dublin, you must stop by VASO Rooftop and Bar. 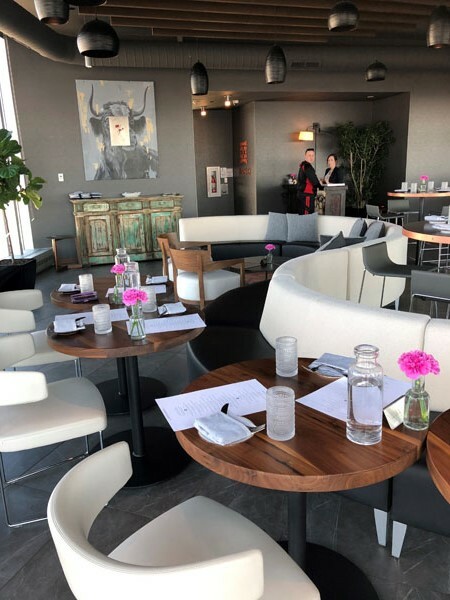 The beautiful glass elevator that will take you directly to the 8th floor of this stylish restaurant created by the Ellis Adams Group (an international consulting firm focusing on all aspects of the hospitality business) to enjoy a beautiful panoramic view of Dublin, Ohio. Guests can enjoy creative and Instagrammable signature crafted-cocktails paired with delicious tapas and other tasty dishes to share. Note that on Saturday and Sunday, guests can also enjoy a European-inspired brunch menu. Guests can enjoy creative and Instagrammable cocktails, such as their signature G&T, vodka based Garden Strolls, or the fan favorite, The Full Montenegro, paired with delicious tapas.